Q68 - What exactly is LAN2? Page 60 of the French version of TA, you ask to concentrate on a spot LAN2 and move and push this spot towards the back. My question is: which is the place or the anatomical zone of this spot (is it the shoulder) or can be described it. Then, in which direction must it be this spot moved towards the back, is on-line with shoulders and the shooting plane of bow or towards the perpendicular back in the axis of the arrow. Indeed, when I move closer the shoulder blade towards the spine my draw shoulder moves towards the back and this angular movement makes spread the hand towards the outside of the face at the time of the release instead of leaving on-line towards the back in line. Thank you very much of the attention which you will wear in my problem. Then, in which direction must it be this spot moved towards the back, is on-line with shoulders and the shooting plane of bow or towards the perpendicular back in the axis of the arrow. Indeed, when I move closer the shoulder blade towards the spine my draw shoulder moves towards the back and this angular movement makes spread the hand towards the outside of the face at the time of the release instead of leaving on-line towards the back in line. P.G.- an old man of France"
Below an explaination what LAN or LAN2 actually means – “Basically Lan & Lan2 are terms used in martial arts sword fighting for ‘blocking’; ‘parry (turn blow aside) and basically obstructing/blocking an opponent’s movements. So basically it is a certain movement in martial arts sword fighting or using the cane or short staff in martial arts. Coach Lee explains it as follows:- Let’s look at what a lot of archers do on release. Basically they do not rotate the drawing shoulder, but have a linear release. As such by not rotating the shoulder, they are blocking(LAN) rotational motion. Now by using the terminology LAN or LAN2 it will remind and focus the archer not to stop or impede the rotational motion. Therefore, if they do not move LAN2 they are ‘blocking/impeding’ rotational movement, necessary to execute the shot biomechanically correctly”. LAN2 is not an anatomical part of the body, but an imaginary location near the shoulder, as indicated by the red area in the photo. It is a concept that the archer can use to visualize the movement of the draw shoulder. 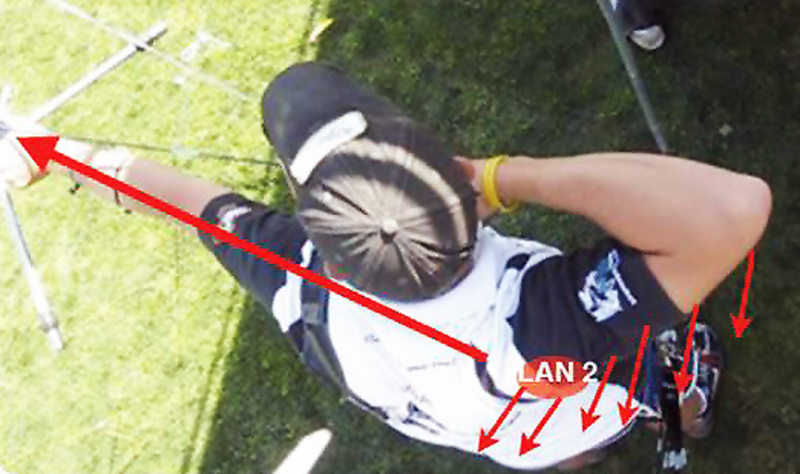 The direction of the LAN2 Spot is indicated by the small red arrows and is approximately parallel to the shooting line and slightly downwards. The reason that your draw hand comes away from your face is that there has to be a certain amount of tension in the drawing arm bicep to ensure that the included angle between the upper part of the lower arm and bicep doesn’t open up during the release. To focus on this place a pencil in the crook of the drawing arm and there should be sufficient pressure there to keep the pencil there throughout the shot.